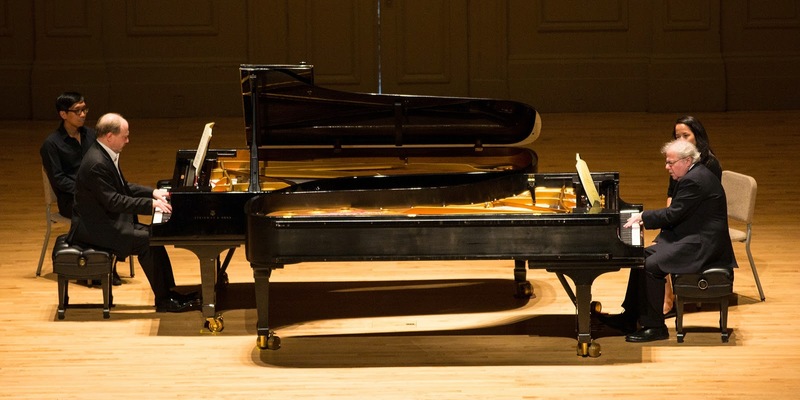 Marc-André Hamelin returned to Celebrity Series last weekend in a concert haunted by doubles. The program was even comprised of two sonatas - the latter one scored for two pianos, for which Hamelin was joined by a second virtuoso, the brilliant Emmanuel Ax. But of course what counted artistically was that two presences - Clara Schumann and the great Ludwig van - shadow these two works, particularly the first in the program, the Piano Sonata No. 3, in F minor. Beethoven, needless to say, always haunted Brahms; his achievement loomed over the later composer as both inspiration and challenge. Clara was a lesser influence, but became a major player in his emotional life once Brahms moved into the Schumann household, after husband Robert's famous leap into the Rhine. He remained there for two years, during which time it was widely believed he not only shared Clara's home but also, eventually her bed. The third sonata was completed during this complicated time - which its almost contradictory complexity seems to reflect. It's a sprawling work that all but battles itself until a crashing finale that seems to bring something (perhaps Beethoven?) finally to rest; tellingly, Brahms never wrote another sonata for solo piano, even though he completed this one at only twenty. Thus perhaps it's no surprise that its climax only comes after an extended musical wrestling match in which snatches of Beethoven's Fifth Symphony and "Les Adieux" sonata can be glimpsed amid the fray. But Clara often drifts through the music room, too, and while Hamelin's command of the clarion salvos fired at Beethoven proved nothing less than amazing, it was his tender conjuring of Clara that made for his most memorable playing. The famously melting Andante was nearly trembling in spots, and the Intermezzo seemed more hushed than usual in its mystery. He was also brilliant at hanging onto melodic lines that rippled from one hand to the next (and then back), even through dense thickets of competing chords. I did feel that the finale was almost relentless in its ringing attack - and you could argue that in Hamelin's rendering, Schumann and Beethoven never really shook hands; but most of the crowd clearly felt otherwise - and in the end, in terms of sheer pianistic prowess, it was hard to imagine a more commanding performance of this demanding work. Only a pianist at the level of Emmanuel Ax, in fact, might have given Hamelin a run for his money - so it was wonderful that Ax himself turned up to supply the second pair of hands required by the Sonata for Two Pianos in F minor (Op. 34b) - another sprawling giant, but one with a curious genesis. The work began its life as a double cello concerto, in fact - but you probably know it better as a quintet for strings and piano (which we have thanks to Clara's intervention). And truth be told, I doubt this version will ever supplant that one in the popular imagination. But the double piano version certainly has its moments, particularly in the Andante and the following Scherzo, where there's a call-and-response dynamic that the more variegated quintet lacks. And elsewhere there's a reliable thrill in the many precise hand-offs from one virtuoso to the other, as Brahms shifts focus from one keyboard to the next. Hamelin played at full-stick, while Ax's piano was lidless (see photo at top) - which seemed to achieve a precise balance between the two instruments. And the performers themselves remained in such perfect synch, their double dynamic was so very seamless, that they often seemed to merge into a single-minded but four-handed performer, a super-player on a super-piano, if you will. Occasionally, it's true, the resulting cascades of notes coalesced into unyielding screens of sound; but more often than not, a single will seemed to be skipping from one keyboard to the next - a very intriguing effect indeed. Sometimes there's just nothing like pure technique, is there - particularly when it comes in pairs.